One piece molded construction for durability and strength. Rubber seals mounted on body opening. Increased laminate thickness at attachment points. Flood coated interior for easy cleaning. Special weight saving construction features. Door chains or rigid stops. Door corners rounded for strength. Convex door profile for extra stiffness and strength. Recessed adjustable anti-warp strip on back of each door. Door latches and hinges recessed for better weather proofing. Double skin two piece door with smooth gelcoat finish on inside and outside faces. 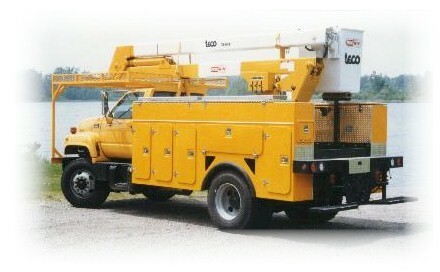 Length 100" up to 218" inches in length for dual or single axle vertical and horizontal storage areas. Height from 40" up to 48". Vertical storage compartments 24" to 48". Horizontal storage compartments 60" x 24". (Custom colours available at an additional charge). 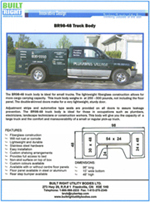 Gripstrut, aluminum checker-plate or non-slip gelcoat on box top. Fiberglass front thru-box and rear cross box with doors and shelves. Two stage chrome plated rotary type locks, keyed alike. *Stainless steel hinges and rotary locks. White gelcoat finish standard, fleet colours optional using premium grade fade resistant N.P.G.Gelcoat.